Total area: 1200m². Finnish sauna, private sauna for ladies only, steam bath, caldarium, ice fountain, outdoor area, lounge with fireplace, relaxation room, relaxation area and sun terrace, six treatment rooms. Private spa suite with whirlpool, sauna with panorama view, shower with light therapy. Indoor and outdoor pool, gym, hairdresser, tanning bed. The Carlton Hotel reopened in December 2007 following a complete makeover and a return to the original light green & gray colour scheme of 1913. Interior designer Carlo Rampazzi transformed the Carlton Hotel into an absolute gem of colours and unusual shapes. He’s also left his unmistakeable mark on the spa area. 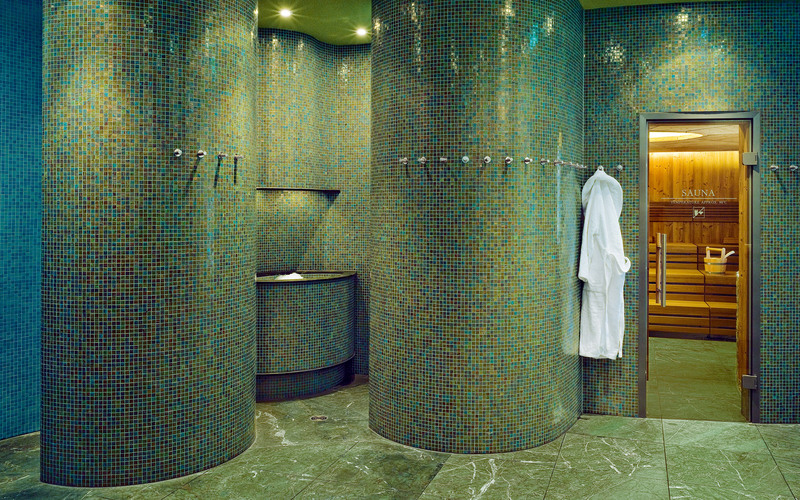 A dream in green and blue mosaic tiles, the new Carlton Spa has been carefully integrated into the historic vault of the building.